Shaker-top jars of lasting sparkle! 1 jar each of 6 bright iridescent colors. Make crafts and ornaments sparkle! Non-tarnishing glitter easily sprinkles over glue. Shaker-top containers reduce messy spills. 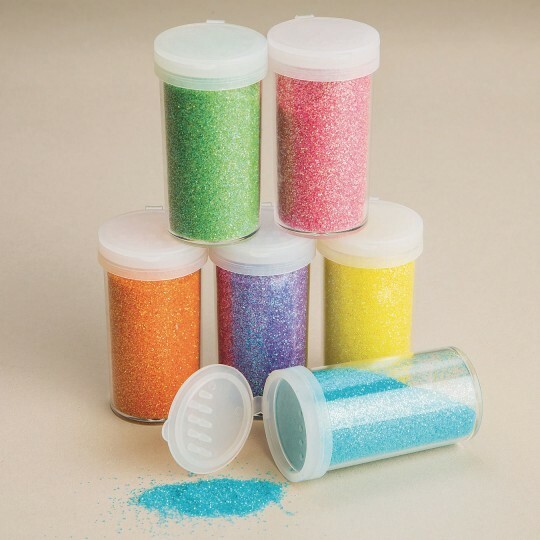 For a longer-lasting sparkle, try our non-tarnishing glitter to brighten craft projects, create beautiful masks, personalize greeting cards, liven up posters and decorate packages. Sprinkle over glue to give ornaments, paper or fabric a touch of brilliance. Convenient shaker-top containers reduce spillage. Includes six 3/4-oz. shaker-top jars of glitter. Specialty Assortment includes 1 each of bright iridescent colors of green, yellow, pink, purple, orange and blue. Messy yes but it is glitter!! !